Book includes a new and modern easy-to-follow layout. Every tai chi movement is presented in 2-4 large photographs with clear instructions, followed by key points to help you learn properly. Simplified Tai Chi Chuan 24 Posture is the most popular tai chi form, and it can be performed in only six minutes. If you are learning tai chi in a school, a fitness club, a community or recreation center, or even the local park, this is the tai chi form you are likely to encounter. Simplified Tai Chi Chuan 48 Posture is a popular tai chi form practiced by those who want a longer, more challenging sequence. Once learned, it can be performed in only 10-12 minutes. 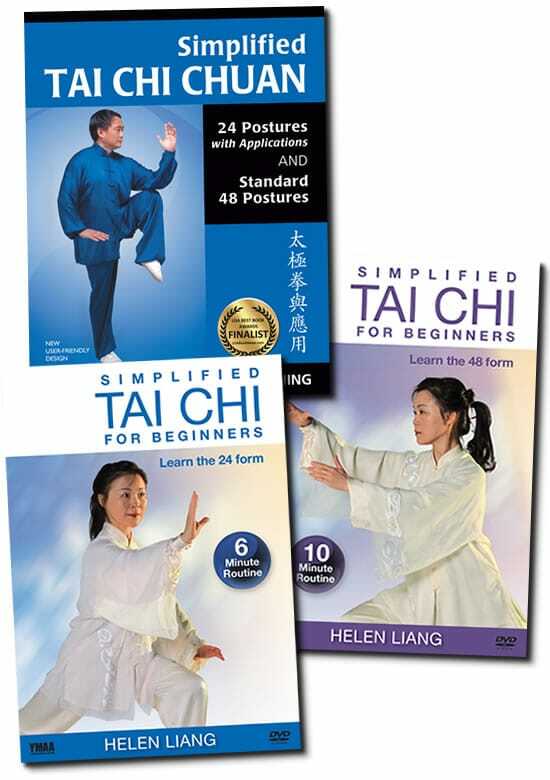 Simplified Tai Chi 24 for Beginners DVD is the perfect way to experience the amazing health benefits of a shortened tai chi form, no matter your current fitness level. The ancient art of tai chi is often described as “moving meditation” because it stimulates your mind, body, and spirit. The simplified 24-posture form is taught and demonstrated in detail by Master Helen Liang in short, easy-to-follow sections. This popular form is shown clearly from multiple angles, with step-by-step instructions. With this 6-minute tai chi form, you’ll feel stronger and more energized. Tai chi is known for improving balance and keeping the mind sharp and positive. This tai chi form is excellent for beginners at any age, those who want a low-impact whole-body exercise, and those with limited time. The tai chi 24 form takes only 6 minutes to practice but offers benefits for your entire life. Experience Tai Chi Health in 10 Minutes and a get great workout. Simplified Tai Chi 48 for Beginners is the perfect way to experience the amazing health benefits of a shortened tai chi form, no matter your current fitness level. The 48 form is combines the best of several forms into Simplified Tai Chi. The ancient art of tai chi is often described as “moving meditation” because it stimulates your mind, body, and spirit. The simplified 48-posture form is taught and demonstrated in detail by Master Helen Liang in short, easy-to-follow sections. This popular form is shown clearly from multiple angles, with step-by-step instructions. With this 10-minute tai chi form, you’ll feel stronger and more energized. Tai chi is known for improving balance and keeping the mind sharp and positive. This tai chi form is excellent for beginners at any age, those who want a low-impact whole-body exercise, and those with limited time. Popular form form demonstration and competitions. Combines the best moves of several Tai Chi styles.